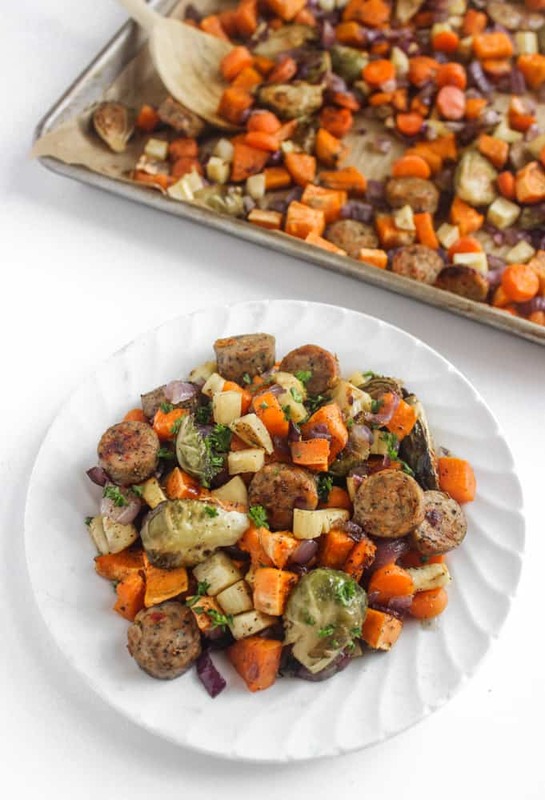 One-Pan Chicken Sausage & Roasted Veggies: a simple meal with crispy roasted veggies, sausage, and just one baking sheet to wash afterward! 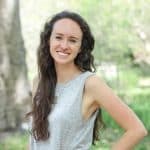 On some recipes I’ve posted, a few people have commented asking either a) how I cook in my dorm or b) maybe even more mysteriously, how I take pictures. I share a hall kitchen with 50 other girls, so I usually try to cook when no one else is using the kitchen. 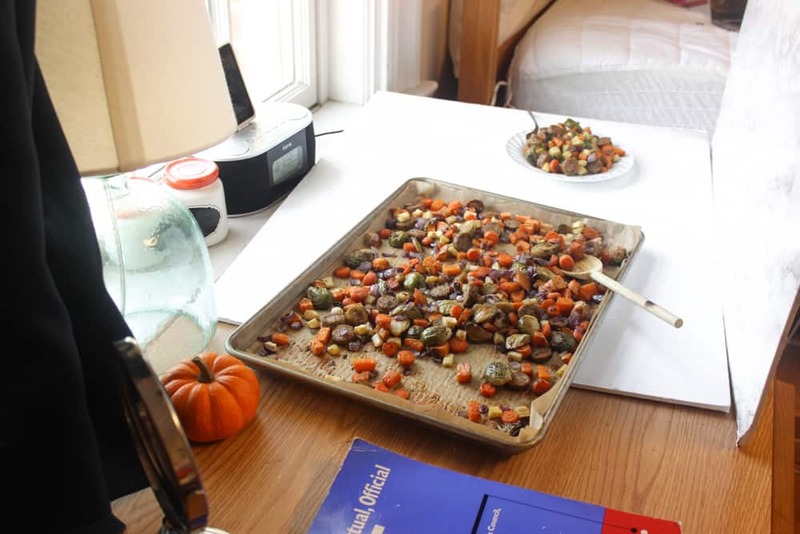 For example, I started making this one-pan chicken sausage and roasted veggies recipe at 10 a.m. on a Saturday after an early run while I was also doing my laundry. 10 a.m. on a Saturday on a college campus is like 7 a.m. for the rest of the world, so I had the kitchen (and laundry room) all to myself. And it was ready a little after 11:00 for an early lunch. Chopping all of the veggies takes a few minutes, but this recipe’s easy because it’s so mindless. Just chop, season, and then put everything in the oven. Afterward, the only thing to wash is the baking sheet, which is also super easy if you use parchment paper. I snapped a few pictures as quickly as I could, and then devoured a big plate of this for lunch. 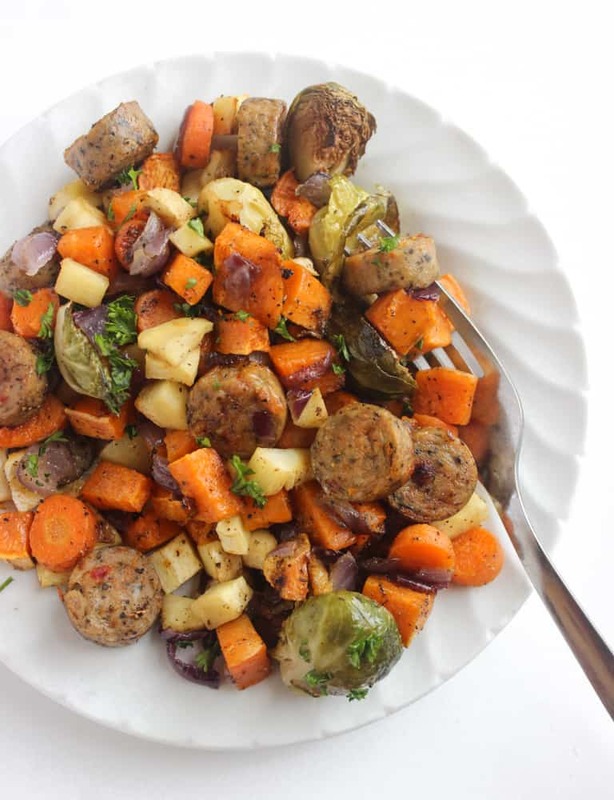 I’ve recently discovered a love for chicken sausage, and I can never have too many roasted veggies in my life, so having this for lunch + 2 meals later was heaven. I used sweet potato, carrots, red onion, parsnip, and Brussels sprouts this time around, but I’ve also used butternut squash, yellow onions, rutabaga, and even turnips. Rutabaga and turnips aren’t veggies I usually pick out at the grocery store, but I’ll sometimes add them to a mix of veggies just for something different. I typically avoid using broccoli and cauliflower when I roast a mix of veggies because they don’t need quite as long to cook as root veggies do and extra-roasted broccoli/cauliflower turns to mush. Mushrooms and eggplant release liquid when they’re cooking so they’re also not as great for the crispy veggie factor. Sometimes, I’ll do a separate baking sheet with just those and mix them together afterwards– totally your call. -Flip on the broiler for just a minute or two at the end to crisp everything up. Just watch the veggies closely! 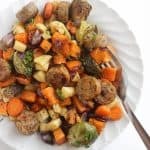 If you try out this one-pan chicken sausage & roasted veggies recipe, feel free to let me know in a comment or take a picture and tag me @livbane on Instagram. Hope you enjoy! Preheat oven to 425 degrees and line large baking sheet (I use 10x15) with parchment paper. Peel and chop sweet potato, carrots, red onion, & parsnip. Halve Brussels sprouts or quarter if they’re large. Use a paper towel or clean dish towel to pat veggies dry if they’re wet from being washed. 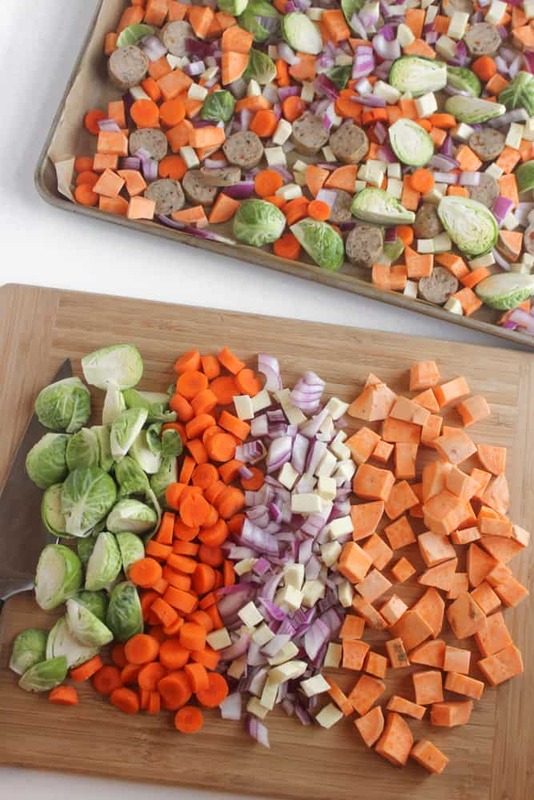 Add veggies to baking sheet, along with sliced chicken sausage. Drizzle with olive oil and season with black pepper, garlic powder, and salt. Bake for 25-28 minutes at 425 degrees, stirring halfway through. Turn on the broiler for 1-2 minutes at the end to make the veggies crispy. Serve immediately. Do you make any one-pan or one-pot meals that you love? Feel free to share the recipe- links encouraged! Any tricks for using fewer dishes while cooking? you’re photography set up is awesome! 🙂 small but it works so well!! also love the broiling trick, i do it too, but there’s been a few times lately where i accidentally let it got 3-4 minutes, and that does not turn out well… oops. Our dishwasher is broken. This recipe might be worth a try. Oh no! That’s a bummer! My light reflector is actually just a white foam board lol! Hadn’t even thought to make this on the stove– sounds great, too! I am all for one pan/pot dishes and this one looks DELICIOUS! Generally all of our meals are made in one pot as I’m often making something just a tiny bit different for Jesse (for example, if I’m making spaghetti I’ll use tomatoes for him and nomato for me) so I already have to clean up double the dishes and don’t want to make things any harder on myself, haha! I’m with you– I can’t stand washing dishes! Oh wow, I didn’t think about flipping on the broiler at the very end to crisp everything up! I totally need to try that. I haven’t had brussels sprouts in so long, but this is making me crave them! The broiler thing is one of my favorite kitchen tricks! Ahhh i love how you make it work for you Liv!! Getting up early on a weekend, rather than laying in bed hungover and pathetic is a muuuuuch better and pro-active way to start your day. I definitely miss going for runs around the UBC campus at that time of day as well, when it seems like the world is still sleeping. Running around campus when everyone is sleeping is one of my favorite things, too. It’s so peaceful, not to mention easy to cross the streets! Somehow I didn’t discover chicken sausage until like…last year? But I totally love it now. Hope you’re having a great week, too, Alyssa! This is PERFECT for a quick, weeknight dinner! YUM! Thanks, Jennifer! I could easily make and eat this once a week! this looks sooo good! I never even thought about using chicken sausage! I need to make this! Thanks! You’ll have to try it and let me know what you think- this is one of my sister’s favorite meals (and mine, too)! Can the chicken sausage be raw or does it have to be cooked first? I don’t want to double cook it and dry it out but I also don’t want it under cooked!